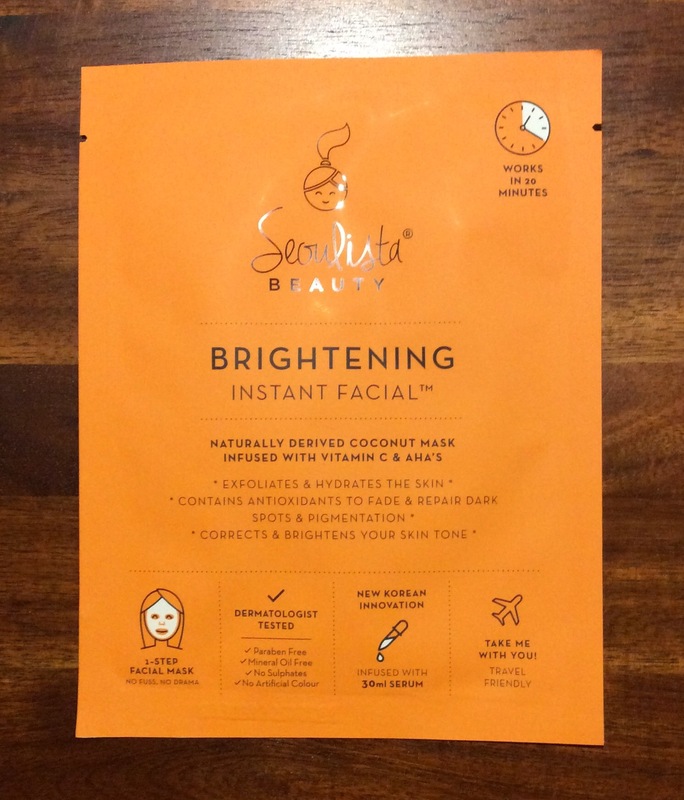 I was delighted recently to v kindly receive four Seoulista Beauty ‘Instant Facial’ Sheet Masks (RRP £7.99 each) to try *(PR sample). I had never heard about the range so was intrigued – you can find out more details here. 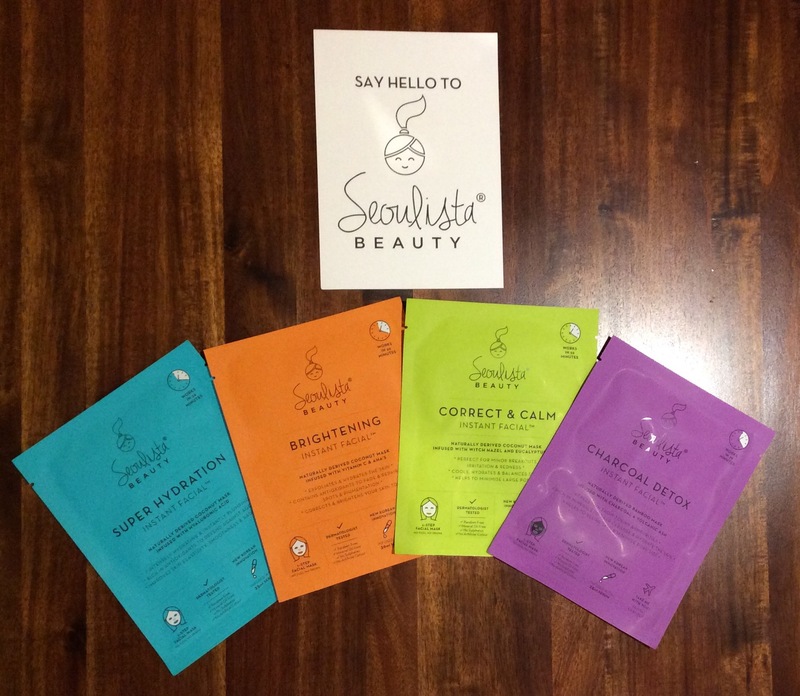 States, Seoulista Beauty Instant Facials are free from parabens, mineral oil, sulphates and artificial colours. 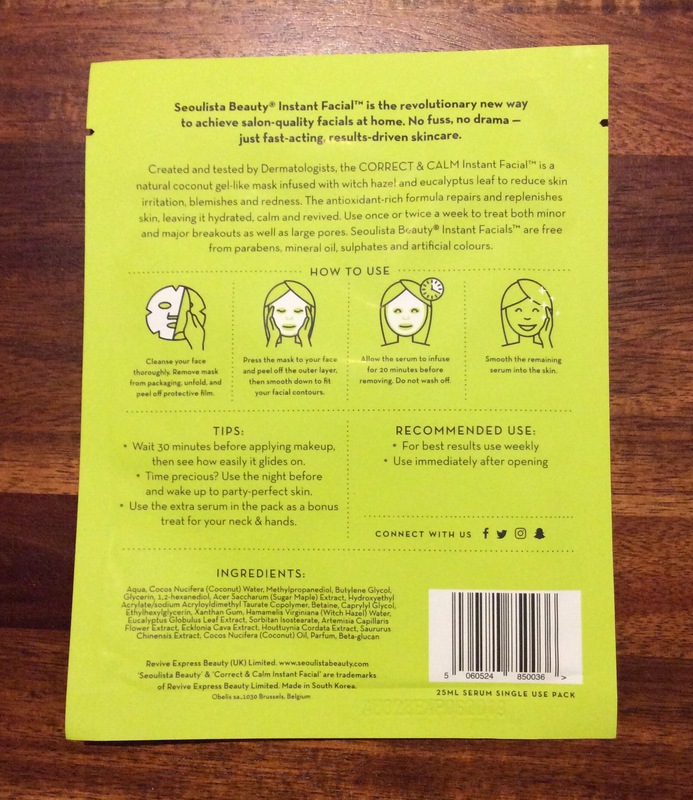 Each packet contains one face mask and as usual you cleanse your face thoroughly first, then you are advised to remove face mask from packaging, unfold, and peel off protective film. Press the mask to your face and peel off the outer layer (this is the same for all the masks with the exception of the charcoal one, no backing to remove, a cloth style mask), then smooth to fit facial contours. Allow the serum to infuse for 20 minutes before removing. Do not wash off. Smooth the remaining serum into the skin. I am going to let you know the results I got with each mask underneath each one – however going to include a full summary at bottom of what I actual thought of the masks themselves. 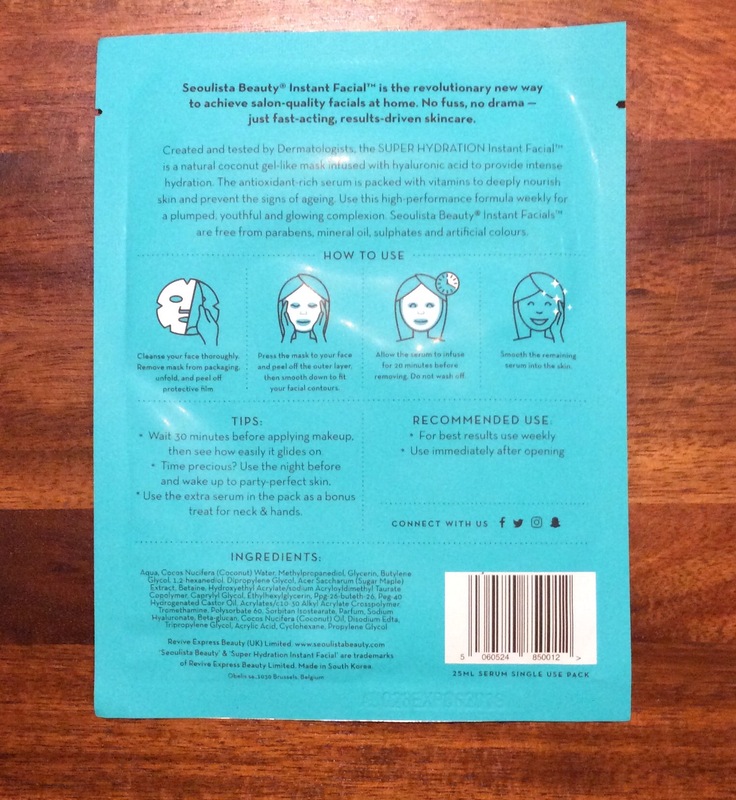 Off white mask – Did feel refreshing on my skin, no irritation and did leave my skin feeling hydrated and looking brighter but would not say really helped to exfoliate my skin and unable to judge if fades and repairs dark spots & pigmentation as I am lucky and do not have either. But I was happy that I could use the extra serum in the packet to treat my neck & hands as well. May purchase this mask. improves skin elasticity, smoothness & radiance. Off white mask – Also felt refreshing on skin and I did feel that this mask was working more on my skin, a v slight tingling feeling but not uncomfortable. 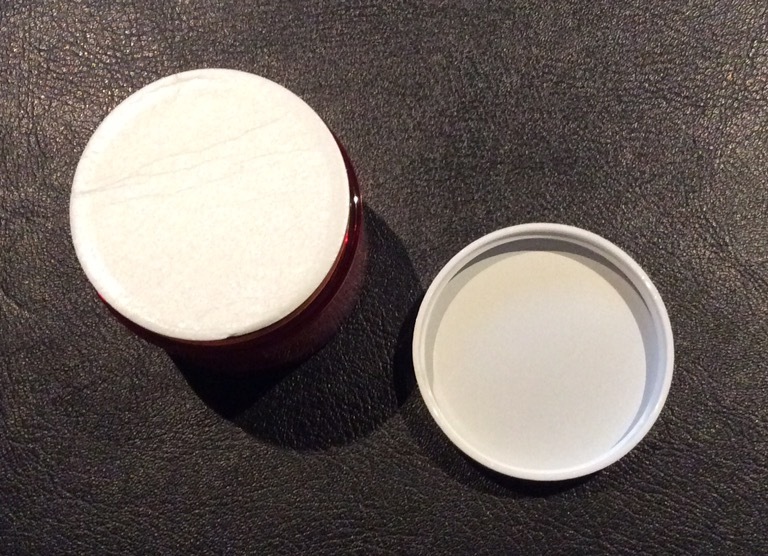 My skin did look more radiant and refreshed after I removed it and my skin did feel lovely and soft, not sure about the plumping element though. Again able to use the extra serum in the packet to treat my neck & hands as well. Will purchase this mask. helps to minimise large pores. 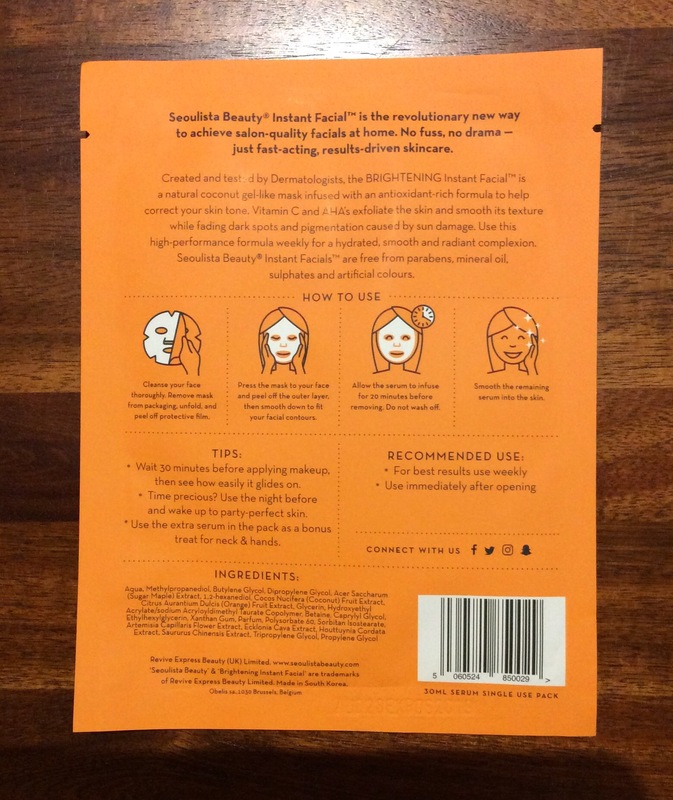 Off white mask – Felt cooling on skin and did feel this mask was working on my skin as well but again not uncomfortable. My skin did feel cleaner, hydrated and a slight blemish did seem less irritated, however pores round my nose did not look any different / minimised, but again able to use the extra serum in the packet to treat my neck & hands as well. Not sure I will purchase this mask. helps to refine skin & minimise pore size. Black cloth type mask felt more comfortable on the skin, my favourite out of the four. This one also fitted better and I could have relaxed and kept it on for longer. My skin did feel it had got a deeper cleanse but also still felt hydrated. Pores round the nose also appeared less noticeable. Will definitely purchase this mask. There was a slight fragrance of all of the masks but none were overpowering, there is a lot of serum on the masks & inside the packet which is great but makes it quite difficult to remove the backing prior to and after applying the mask to your face. 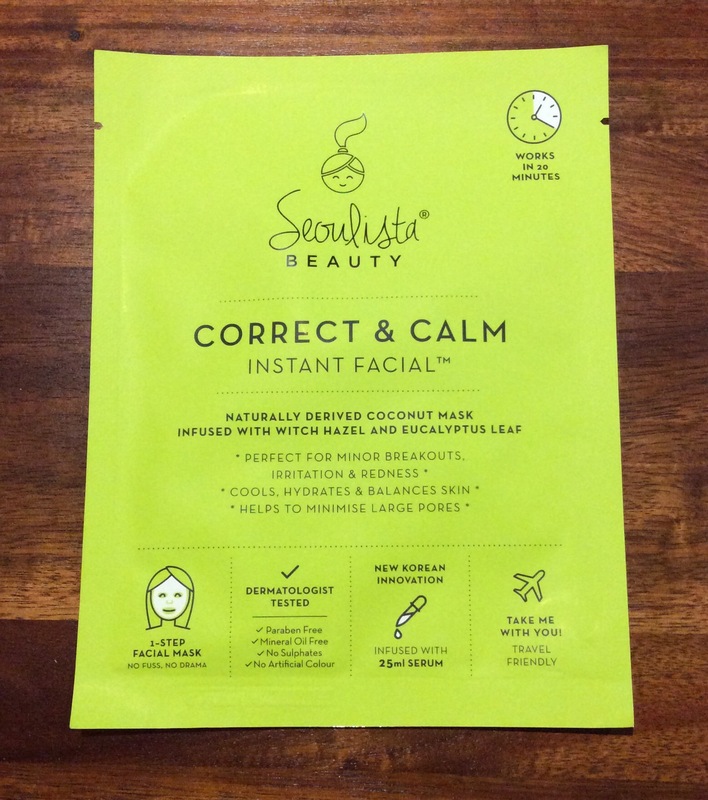 Mask does smooth down ok and fits quite well but not just as good a fit as some other sheet masks I have tried, (this was the same for all the masks with the exception of the charcoal one). I preferred the charcoal mask on my skin as felt more comfortable and could have left on longer period of time, the other three I was happy when it was time to remove them as just could not relax the same with them. For each mask it states not to wash off smooth remaining serum into skin and wait 30 minutes before applying makeup – however for me personally this was not possible skin still felt too tacky uncomfortable for applying makeup over. 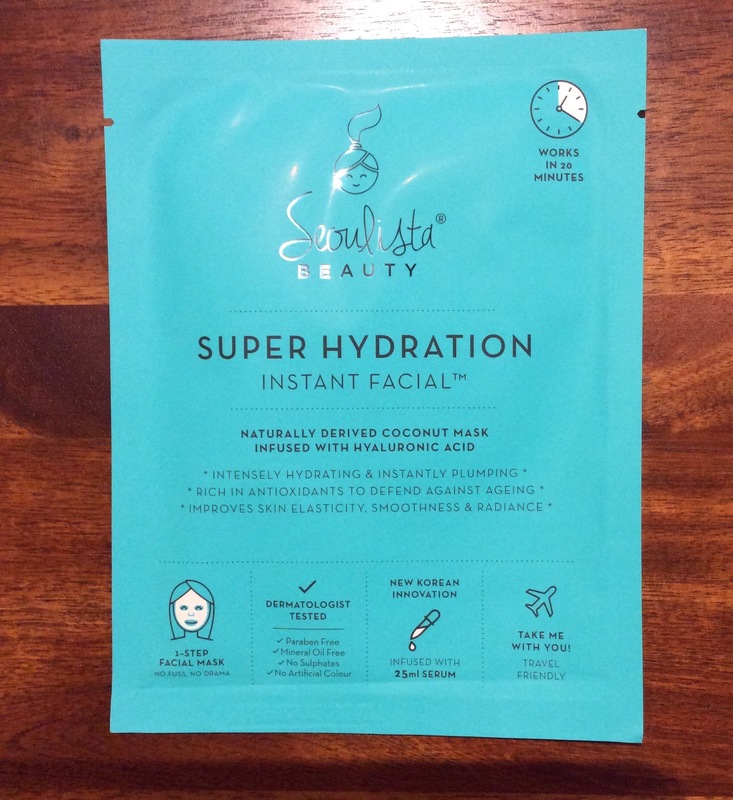 I found it better and would recommend applying any of the masks in the evening prior to bed and then you can just smooth any remaining serum into the skin and let it work overnight and rinse off in the morning again. 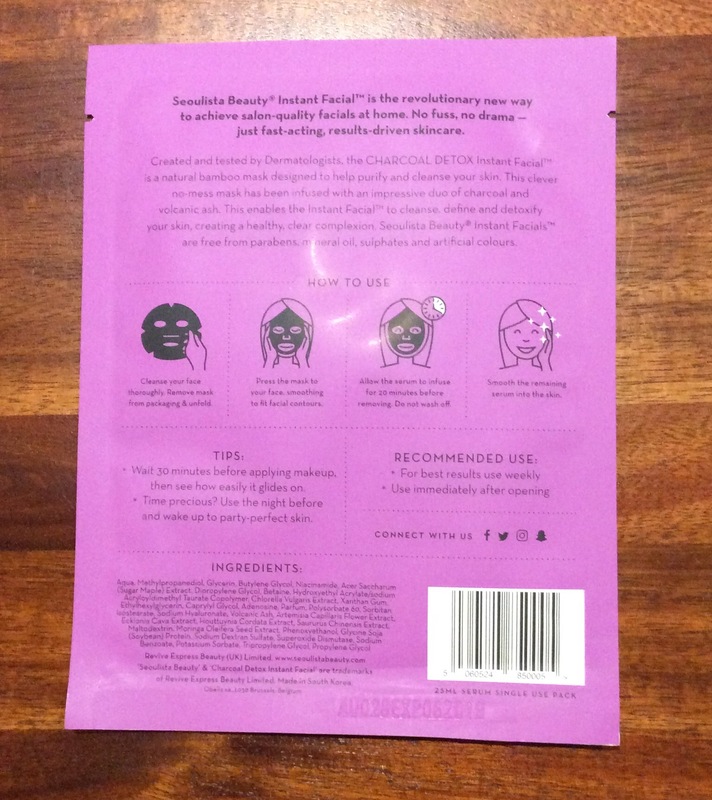 Although I enjoyed trying all the masks, they are reasonably priced, perfect for travelling and would recommend trying for yourself there are only two of them I would definitely go out and purchase now, the Charcoal & the Super Hydration but that is just personal choice so you may prefer one of the others more. Your can purchase from a number of stores, including Gordonsdirect.com – for a list of stockists please see link here. Look forward to any comments you may have. If you are not already a follower would love you to follow my blog too – would mean a lot. Will have more posts up over the weekend. Thank you – take care and hope you have a great weekend. 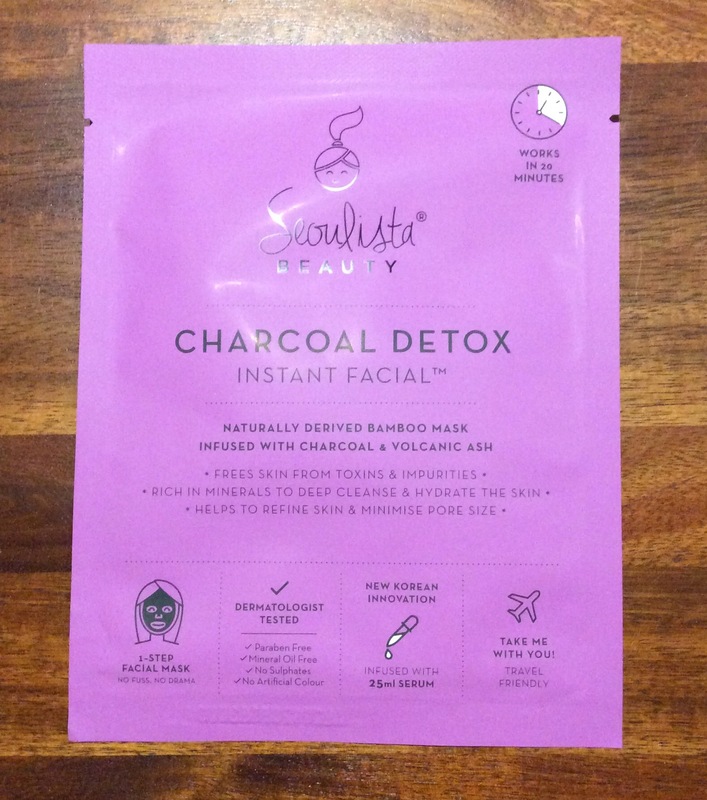 The charcoal detox mask sounds great!